Let’s dial back to the October 1954 issue of American Science Fiction Magazine, published in Australia by the Malian Press. There isn’t a “loser” tale in this issue. 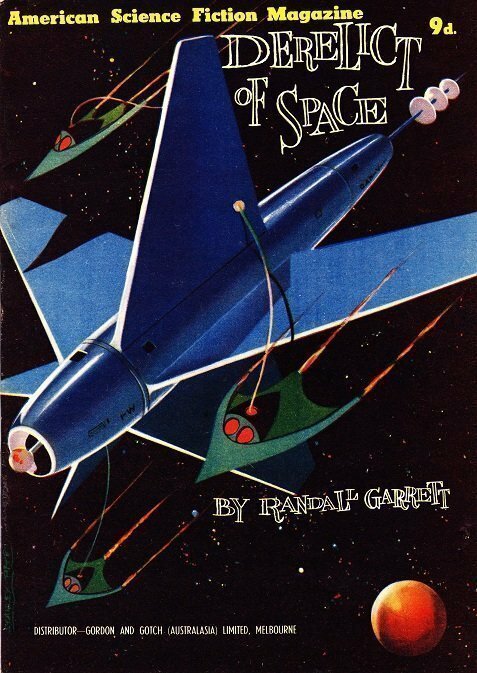 The cover is illustrated by the usually imaginative Stanley Pitt, but this cover is all straight lines, and lacks any real evidence of his capabilities. The cover title, DERELICT OF SPACE by Randall Garrett, originally appeared in the American pulp Future (March 1954) as “The Wayward Course.” Intriguing tale of the far-flung future in which humans are at a stalemate with aliens over border territory. We then stumble (in space, of course) across a derelict space vessel that turns out to be thousands of years old. Encased inside are humans, perfectly preserved. Thawing one out (a woman) they discover within these ancient humans a higher intellect, mind-reading and hypnotic abilities. Fearing she is a plant by the aliens, they lock her away and plan to blow up the rest of the frozen bodies. But when she escapes an impregnable cell, all hell breaks loose. As they hunt her down, the question remains, until solved at the end: Is she Friend, or is she Foe? The novelette is chased by Poul Anderson’s THE CHAPTER ENDS, debuting in Dynamic Science Fiction (January 1954). Humans have explored and conquered the stars, but the aging battle-scarred Earth is now to be surrendered to an alien race, to keep the peace. All humans are evacuated, save for an elder, whom remains behind, and eventually, alone and surrounded by the quiet and impending darkness, goes quickly insane, in mere minutes…. Tarr Roman’s CAPTAIN BARNES AND THE LAW is a short story of merit, playful tongue-in-cheek wit of how to solve the invasion of an intelligent race from claiming their spaceship while not causing harm. Intergalactic Law states and forbids harming a new and intelligent race, etc. Standard law found in many SF stories. You get the idea. However, when the less-than-pint-sized aliens fail to acknowledge the mountainous humans as rightful owners of their own spaceship (the aliens, so tiny, think it a metallic asteroid or planet, worthy of harvesting for its precious ores, and have already drilled through the hull), Captain Barnes must come up with an ingenious plot to remove the vicious invaders, before they kill his entire crew. The solution is amusing. This story originally appeared in Future (March 1952).